We know that if you are a patient or a family member of someone who has been diagnosed with kidney cancer, one way to make life easier is to speak to someone in a similar position on the Kidney Cancer Careline. If you would like to talk to someone who has experience of what you are going through, our patient support team is happy to help. Or you can join other patients and carers on our patient and carer forum. The kidney cancer Careline is a telephone helpline operated by our patient support team who can draw on their own experiences to support and encourage patients and their families during the difficult time following a diagnosis of kidney cancer. The Careline provides the means for patients to make contact with someone who knows exactly how they feel; this understanding and empathy can provide a great deal of comfort during their cancer journey. To talk to someone, you can contact our Careline on 0800 002 9002. Our friendly and helpful patient support team are happy to chat to you and offer advice based on their own experience of kidney cancer between 10 am and 4 pm, Monday to Friday, 10 am and 6 pm Wednesday and 4 pm – 6 pm at the weekend. Outside these hours, please leave a message and we will call you back as soon as possible. Likewise, if you have been diagnosed with kidney cancer, have received surgery, or have cared for someone with the condition and would like to share you experience with others, please let us know by email or by calling 0800 002 9002. You can leave a message or email us outside these times. What is Kidney Cancer Careline? 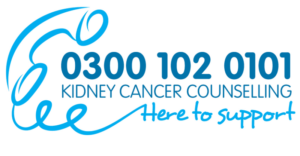 It is a telephone helpline providing information, support and encouragement to kidney cancer patients, their carers and families. It became active on 10 March 2011, World Kidney Day. Members of our friendly and helpful patient support team all have experience of cancer and knowledge of the kidney cancer treatment pathway. They are happy to talk with you and offer help and support based on their knowledge of both the disease, and the demands of living with cancer. Our Careline provides the means for patients to make contact with someone who knows exactly how you might be feeling; this understanding and empathy from another patient can provide a great deal of comfort during your cancer journey. We know that if you are a patient or a family member of someone who has been diagnosed with kidney cancer, one way to make life easier is to speak to someone in a similar position. Our Careline can also provide information about the process for accessing the latest treatments for kidney cancer, some of which are not routinely funded by the NHS. We can guide patients and their families through this process, as well as providing information about government funding schemes, such as the Cancer Drugs Fund. Is there any other support you can offer? And you can always email our patient support team (support@kcuk.org.uk) or you can join other patients and carers on our kidney cancer patient forum. If you have been diagnosed with kidney cancer, have received surgery, or have cared for someone with the condition and would like to share you experience with others, please let us know by email or by calling 0800 002 9002. This Kidney Cancer Care website will be developed to contain a wealth of information about kidney cancer, which has been written for patients, carers and family members. The site intends to cover topics such as the signs and symptoms of kidney cancer, how kidney cancer is diagnosed, surgery and current drug treatments for kidney cancer. In addition, topics such as the roles and responsibilities of health care professionals, diet and complimentary treatments, palliative care, practical advice, and emotions and feelings about cancer will be covered. Kidney Cancer UK, the UK’s leading specialist kidney cancer charity, will be developing this site to provide a variety of information on kidney cancer that is relevant to patients, their families and renal health professionals. Should you feel you would benefit from one-to-one counselling over the phone, we are please to announce we provide the UK’s only specialist kidney cancer counselling service. To find out more about this and book session with our qualified counsellor, click here or the image on the right. All medical information and other commentary and/or material referred to or provided through or by Kidney Cancer UK, and other materials posted on our website or provided through our telephone service are not intended to amount to advice on which reliance should be placed, and is not intended to replace consultation with a qualified medical practitioner. We therefore disclaim all liability and responsibility arising from any reliance placed on such materials by visitors to our website or users of our telephone helpline, or anyone who may be informed of any of its contents.